Members may attend the shooting ground only on the designated shooting day, unless otherwise authorised by the committee. At no time must any club member shoot at wildlife or anything other than a designated target, Do not shoot at the target numbers ! At no time must any club member leave litter of any description. 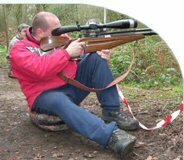 It is the responsibility of each member to ensure that any airgun under their control whilst at the ground complies with all aspects of airgun law. Members are advised to make full use of the chronographs, which are sited in the club container. Lead pellets or pellets approved by the BFTA only to be used. Cocking, loading and firing of an airgun is only permitted at the designated firing points, by the person taking the shot. i) The zero / practiice range. iv) The course target lanes. Guns may not be carried loaded between any of the designated areas. Magazine guns must have the magazine removed from the breech when not at a designated firing point. In the event of a ceasefire order, which will be a single long whistle blow, stop shooting immediately and if your gun is loaded, discharge into the ground. Two whistle blasts indicates the all clear, and its safe to continue. It is preferable that all airguns are carried to and from the shooting ground in a properly fastened case. Under 18's must be accompanied by an adult over 21 years of age at all times. NB: This is a club requirement. If your charge is under 14 years of age, you are required by law to supervise them. NB: This is a legislative requirement and means if you accompany anyone under 14 to the club, you must be 21 years or over and YOU are responsible for their supervision. Attendance at, and membership of this club is conditional upon your acceptance and compliance with these simple rules. Contravention may result in you being asked to leave the site immediately. The club safety officer is on hand to offer advice. A copy of these rules is displayed at the club hut and more comprehensive safety rules are contained within your club booklet.